Today I picked up Jen from the airport. If you haven't been to the Delta Marine Terminal at Laguardia I highly recommend a trip. It combines all the sterile lifelessness of an abandoned Hollywood back lot movie set with the general unpleasantness of being at an airport. Admittance is free and parking is only $6.00 an hour! According to Foursquare there's even a martini bar there! However, my eyes seem to disagree with that assessment. 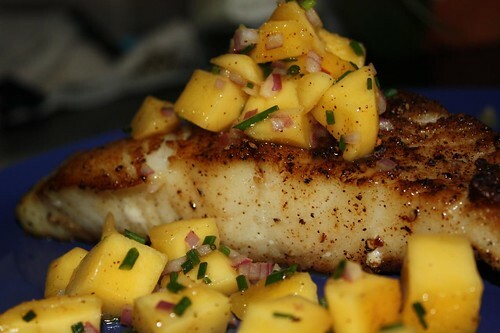 I took some Chilean sea bass out of the freezer and thawed it especially for this occasion. After seasoning it with some cumin, chili, salt, and pepper I seared it in a pan and finished it off in the oven. I used a mango with some chives from my mother's herb garden, red onion, cumin, chili, cayenne, and lime juice as an accompaniment. As a side dish I made one of the sillier looking dishes I've ever seen. 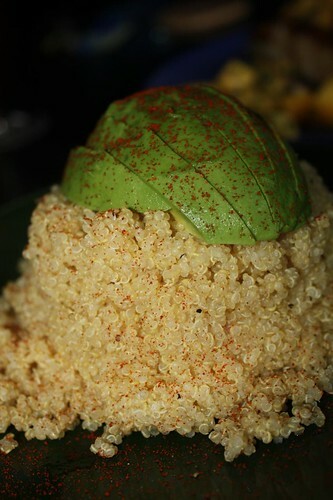 This is some steamed quinoa with lime and olive oil and dusted with cumin and paprika. I sliced up an avocado for the top and couldn't help but notice that it looked like the quinoa was wearing a cycling helmet. I think I should recall this presentation for next year's Tour de France. Just like me to think of ridiculous cycling-themed plate presentations a month too late. Perhaps I can break it out early for the Giro d'Italia! I love the avocado bicycle helmet. I think that I might try to fashion one for myself. It would make a nice snack at the end of a long ride.